Reboot, get inspired, and network! The SEGD Conference is the only annual conference designed for creatives working in Experiential Graphic Design. Check out the full agenda now! NEXPO is an exciting exhibiting opportunity to showcase your company’s capabilities and products to a targeted audience of international design professionals. From public art to urban renewal, tours led by local SEGD members will showcase new offerings that make Atlanta a global city for design and innovation! 3 Generations of Experiential Graphic Design professionals with their vision on the future of practice and place at the conference for XGD! The theme of the 2014 SEGD Conference is Convergence: Crossing Lines. The conference will use the context and inspiration of the exciting city of Atlanta as a launch point for educating, inspiring and connecting our members with amazing projects, stories, and visions from both a local and global perspective. From its location south of the “grits line” to its place in history crossing the “black-white line” as well as its hosting of the ultimate “finish line,” Atlanta epitomizes how excitement, energy, and change happen at the convergence of disciplines, cultures, and ways of thinking. The 2014 SEGD Conference will be held in Atlanta June 5-7, 2014. 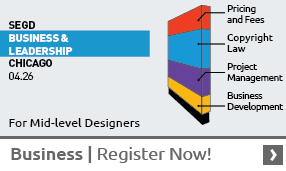 SEGD members enjoy lower conference fees and other benefits, so join today. please create one using the "Register" link in the top right hand corner of this site below the search bar before adding this product to your cart or call 202-638-5555. We were astounded by the creativity and enthusiastic participation of all our members who took part in Design Improv(e) during the 2014 SEGD Conference in Atlanta. Download the full program PDF online now! Print it out to have as a reference before you get to Atlanta. You will receive the final bound copy of the program in your conference bag at registration. The 2014 Academic Summit Program is now available for download as a PDF file! Please print a copy for yourself if you are planning to attend the event on Thursday, June 5. Experiential Graphic Design event opens June 5 in Atlanta. ATLANTA – Wayshowing expert Per Mollerup, urban artist HENSE, award-winning information designer Andreas Uebele, and acclaimed placemaking designer Clifford Selbert headline the 2014 SEGD Conference this week in Atlanta. Themed Convergence: Crossing Lines, the SEGD event is the world’s only conference focused on Experiential Graphic Design, the discipline that creates experiences connecting people to place. Women in EGD: Same as It Ever Was? The challenges women have always faced in the workplace—imbalances in leadership, unequal pay, juggling work and personal life, and living down feminine stereotypes—are still alive and well for women in EGD, despite the more liberal nature of the design world. These realities create both frustrations and opportunities, said participants on SEGD’s Women in Design panel at the 2014 SEGD Conference in Atlanta June 5-7. Perkins + Will’s Atlanta Branded Environments team hosted the SEGD Wayfinding Photo Challenge for attendees of the 2014 SEGD Conference. It was a great way to add even more fun to the conference and explore the power of social media as a tool for placemaking and economic development. More and more, we are seeing how regular citizens with camera-enabled smartphones can help shape the future of a city’s brand. Our goal was to provide further evidence of this changing power structure in the field of design. Ideas, cultures, disciplines, and geographies converged in Atlanta June 5-7 for the 2014 SEGD Conference themed Convergence: Crossing Lines. Just as Atlanta is a city that has been shaped dramatically by social, cultural, and historical forces, design is continuing to shape and reshape itself as disciplines, technologies, and social changes collide. Local designers give tips on things to do and places to go when you come to Atlanta for the 2014 SEGD Conference June 5-7, 2014! We can’t guarantee an Elvis impersonator like we had in Vegas, but you’ll get no boring lectures here—or boring people for that matter. You’ll be inspired by speakers like urban artist HENSE, the creators of the Atlanta BeltLine, wayshowing expert Per Mollerup, and award-winning information designer Andreas Uebele. In the past few years, Design Improv has become a conference favorite. Always inspiring, frequently rambunctious, and sometimes downright outrageous, these half-day sessions team designers up for fast-paced, project-based competitions. Action at the Auction: It’s a Win-Win! The annual Auction for Education at the SEGD Conference is always a win-win: you get a chance to take home some great stuff, and the SEGD education fund and design students benefit. This year, auction items include a Phoenix vacation, PGA tournament package, artworks by keynote speakers HENSE and Andreas Uebele, signed books by Per Mollerup, silkscreened posters by Seymour Chwast, and the perennial favorites—Virginia Gehshan’s famous cookies and a design game hand-crafted by Gary Anzalone! 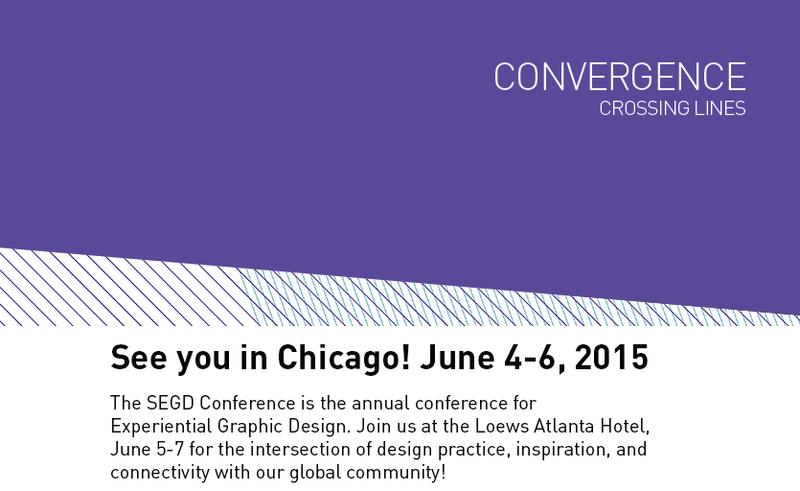 Top 5 Reasons Why You Should Attend the 2014 SEGD Conference! 5. Get your sugar fix! Atlanta is home to Coca-Cola’s global headquarters, and the secret recipe. Experience the World of Coke on one of our conference tours, with its iconic environmental graphics and museum experience designed by members of the SEGD community. Per Mollerup, Dr. Tech., is a writer, design thinker, and professor of communication design at Swinburne University of Technology in Melbourne. Abu Dhabi rose from the Persian Gulf sands in the 1960s after oil was discovered in the region. Once a small pearl-diving outpost, its population has grown to more than a million and today it is the second largest city in the United Arab Emirates—dense with opulent palaces, lush parks and gardens, and some of the world’s tallest skyscrapers. But until now, the streets had no names. Zagat's Christopher Hassiotis has put together a list of restaurants you can't miss during your visit to Atlanta, including King + Duke, where you can order the "King," a one-kilo, bone-in rib-eye steak for two. Women continue to enter the design field in record numbers and, increasingly, are running firms or starting their own. They’re cutting new terrain with their unique leadership styles, project management skills, and ways of thinking. And they’re becoming more and more empowered in a work world that requires agility, flexibility, and long-term focus. Ponce City Market will resurrect a storied Sears Roebuck & Co. building and create a vibrant urban centerpiece for Atlanta. Environmental graphics and signage will help tell its story. Explore this and other dynamic Atlanta projects at the 2014 SEGD Conference in Atlanta June 5-7! When Travel + Leisure magazine recently released its list of the World’s Coolest New Tourist Attractions, Atlanta’s Ponce City Market made the list even though it’s still under construction. Andreas Uebele’s award-winning work stands at the intersection of architecture, typography, and information design. He’ll be a featured speaker during the 2014 SEGD Conference in Atlanta June 5-7! People, Place, and Practice. The only conference for XGD! People, Place, and Practice: These are the thematics that make the SEGD conference the only annual event exclusively focused on Experiential Graphic Design. SEGD will be showcasing a stellar lineup of speakers, panel discussion, and networking events at the 2014 SEGD Conference in Atlanta in just 60 days. But you must register now to experience it all! Call 202.638.5555 or signup for the conference online today! Atlanta artist Alex Brewer combines fine art, graffiti, and a graphic sensibility in his city-scaled murals. He'll be a featured speaker at the 2014 SEGD Conference June 5-7! Bring your running shoes! This is a great town for running, and the conference hotel, Loews Midtown, is close to Piedmont Park, the Atlanta BeltLine, and great running paths. From its roots as a railroad terminus to its current status as a poster city for urban redevelopment, Atlanta has always been shaped by social, cultural, and historical convergence. Design innovation is part of the mix, too. Atlanta is an ideal setting for the 2014 SEGD Conference June 5-7. Register by March 14, for your chance to win up to four nights’ complimentary stay at the Loews Atlanta Hotel! "You can't beat the view from the SunDial Restaurant at the Westin Peachtree Plaza. Whether in the lounge or at the restaurant, both complete one full 360-degree revolution, providing a full panorama view of Atlanta. Plus the exterior glass elevator is a trip in itself." In preparation for the 2014 SEGD Conference in Atlanta June 5-7, we've asked Atlanta-area SEGD members and friends to share their favorite places for eating, shopping, working, and playing. Here is the first in our series, My Atlanta. How can we NOT lead with the Walking Dead? SEGD is pleased to announce that Per Mollerup will be a keynote at CONVERGENCE in Atlanta this June. Author of the recently revised Wayshowing > Wayfinding, Mollerup with join other international speakers as part of our series of Global Ideas: Convergence: All Together sessions on Saturday June 7. Atlanta native and graffiti artist Alex Brewer, known as HENSE, will be featured in an keynote session at SEGD CONVERGENCE in Atlanta this June! Check out HENSE’s recent feature interview on Design Boom. Early registration ends on 1/1/2014. Lock in savings of $200 by registering now! You can register online, by phone, or by submitting this PDF via email! We’re pleased to launch our 2014 Conference Video — CONVERGENCE will take place June 5-7 at the Loews Atlanta Hotel in Midtown. Stay tuned to the CONVERGENCE site for news and updates on our program as it develops. Cliff Selbert, FSEGD and partner of Selbert Perkins Design will be joining the lineup at Convergence in Atlanta with a keynote presentation about how a sign can change the world. More information on the UAE project that brought signs to an entire country for the first time can be found at the SPD website.